I like GIANT flowers. The bigger, the better! 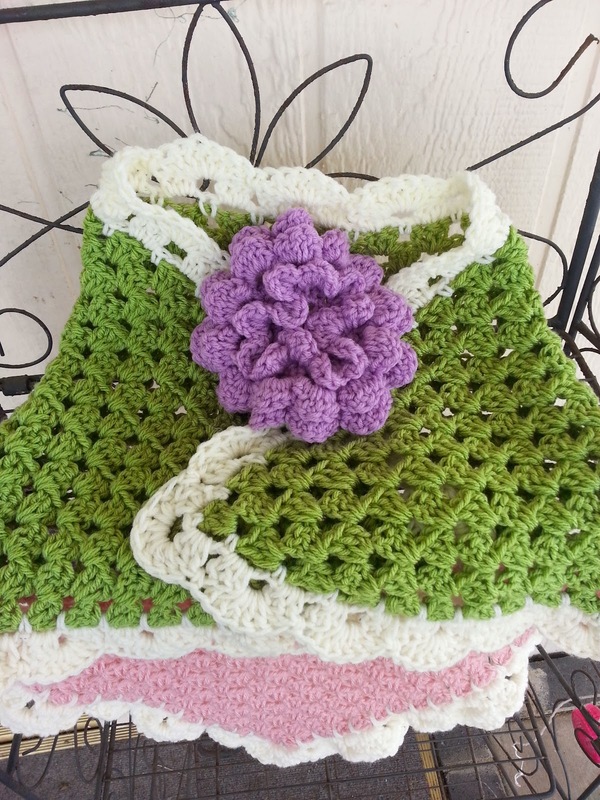 You may have noticed this flower on my favorite poncho. That's a GIANT flower. Trust me. 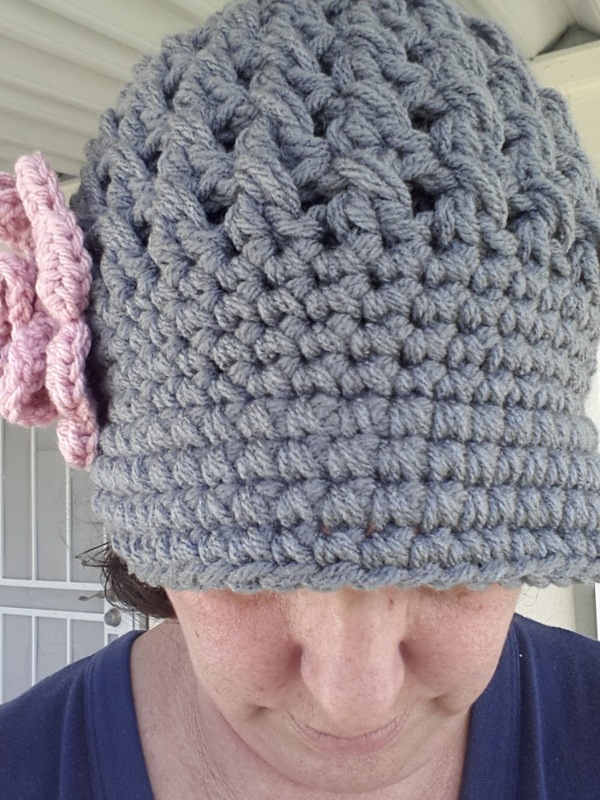 You can make one of these too with some worsted weight yarn, a hook, and a button! Row 1: Begin with a magic circle. Chain 2 and crochet 12 HDC. The chain 2 does not count as a stitch. Row 2: Chain 1, 2 SC in each stitch around. 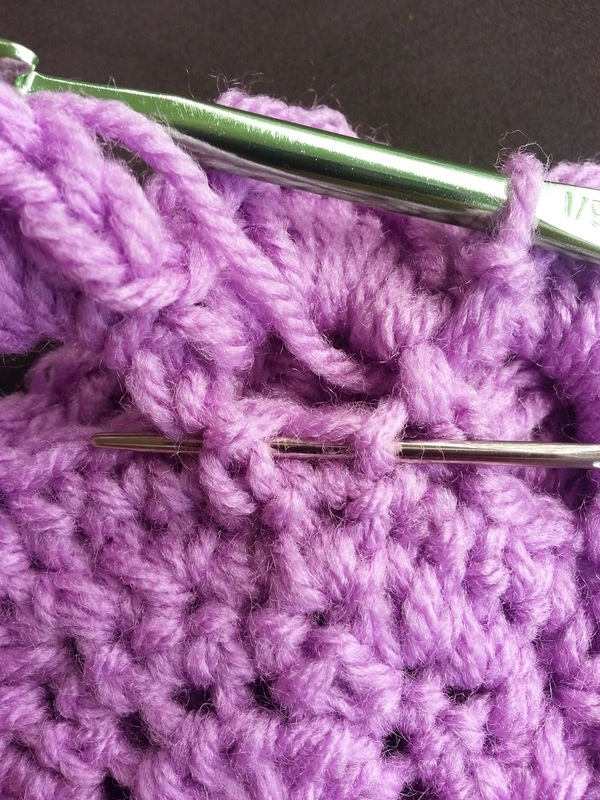 Slip stitch to the top of the first SC to close. Row 3: Chain 1, SC in the next stitch, chain 2, skip 1 stitch, SC in the next. Continue around. SC in the next stitch after the join. SC, ch 2, skip 1 stitch, SC in the next. Slip stitch to first SC to finish final loop. Row 4: To form each petal, 1 SC, 2 HDC, 1 DC, 2 HDC, 1 SC in each loop around. 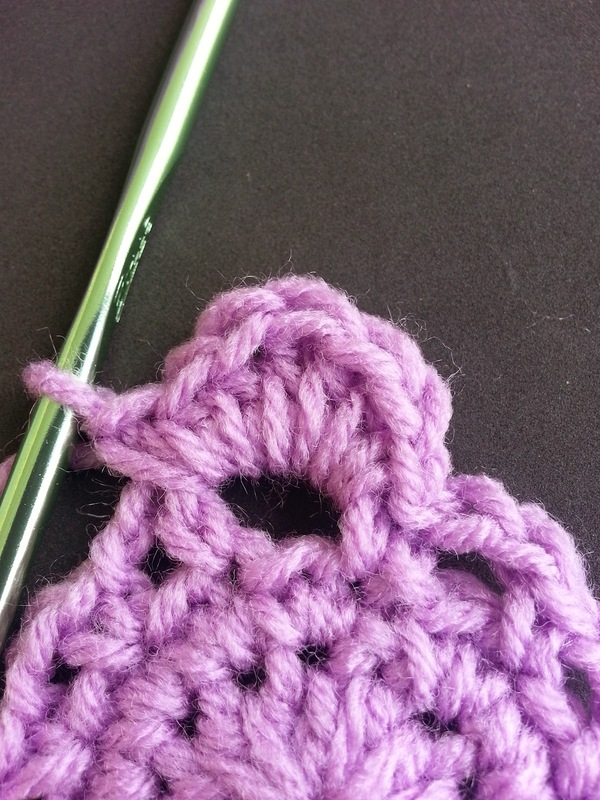 Continue the pattern for each petal in the loops around. Your petals may begin to fold and ruffle because we are putting so many stitches in small loops. 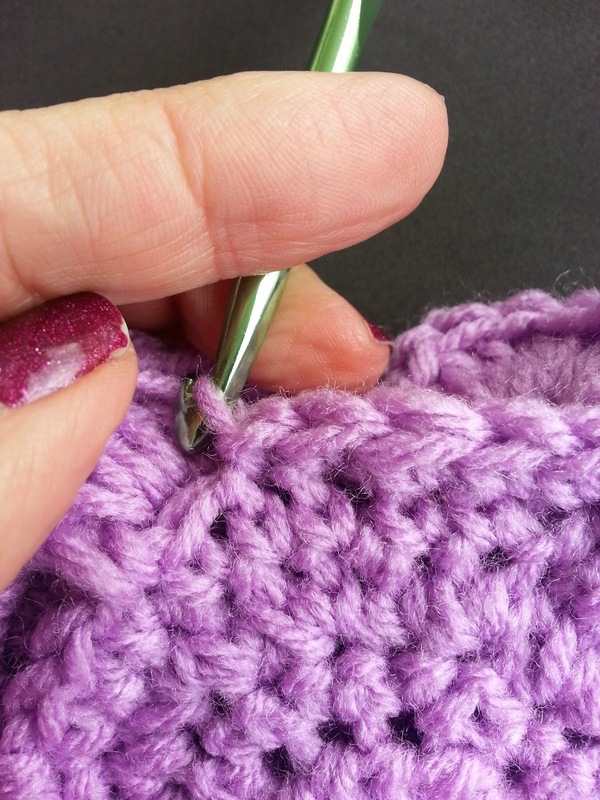 At the end of the round, remove your hook and insert in it through the marked stitch from the BACK of your work. 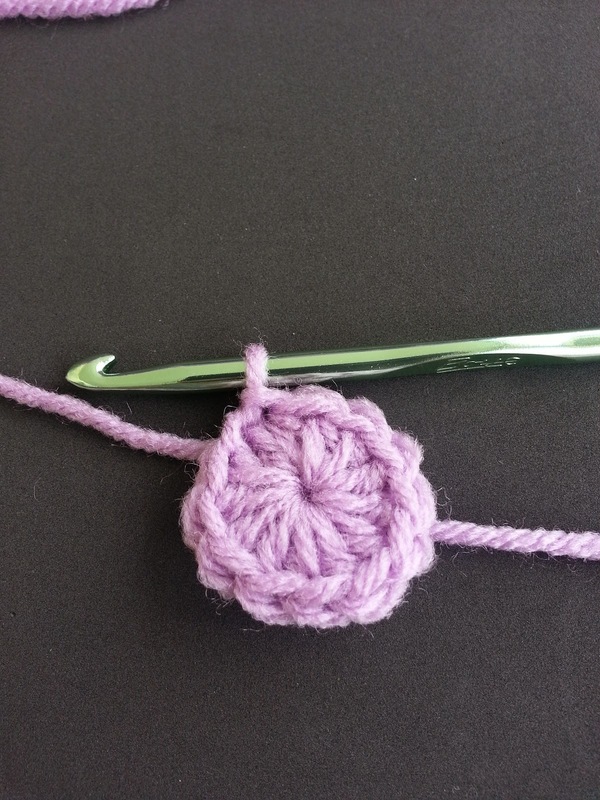 Pull the loop through the stitch to the back of the flower. Turn your flower. The rest of the flower will be made on this side of the flower. You may be wondering why we are flipping the flower. If the petals keep going the same direction, they will sit inside one another and not give us the depth that we are looking for. To cause the flower petals to push forward, we flip the flower and the new petals will be made in a different direction. Row 5: Chain 1, 2 SC in the next stitch, 1 SC in the next. Continue around. 2 SC in the stitch from the previous row that falls between the posts of the loops. Continue with 2 SC, then 1 SC around. Slip stitch to the top of the first SC to complete the row. Row 6: Loop Row. Chain 1, SC in the next stitch, chain 3, skip 2 chains, SC in the next. Continue with chain 3, skip 2 chains, SC in the next around. Slip stitch into the first SC of the row. Row 7: Petal Row. 1 SC, 2 HDC, 2 DC, 2 HDC, 1 SC in each petal around. If you flip your flower over at the end of the row, you will see that the new row is pushing the first row forward. Row 8: Finish Row 7 by slip stitching into the SC from the first loop in row 6. 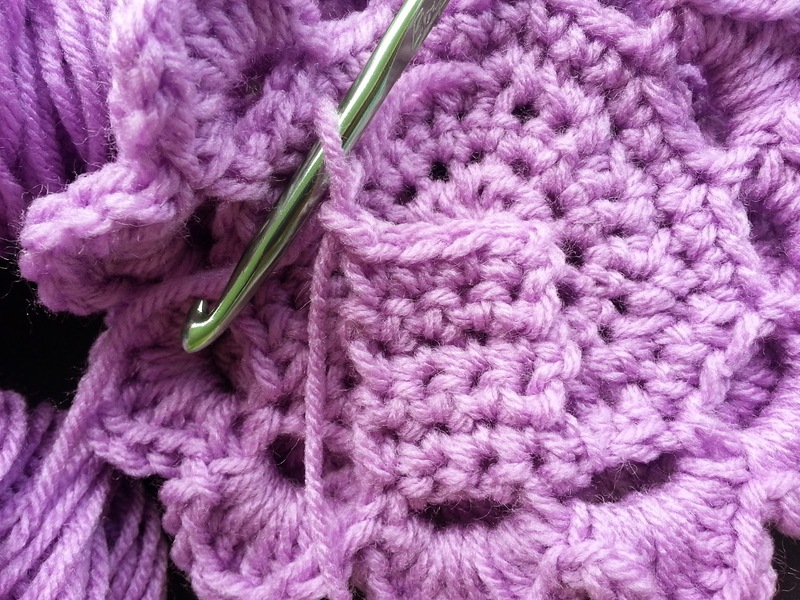 Then, crochet 1 SC in each stitch from row 5. Join to the first SC to complete the row. Row 9: Loop Row. Chain 1, SC in the next stitch, chain 3, skip 2 chains, SC in the next. Continue with chain 3, skip 2 chains, SC in the next around. Slip stitch into the first SC of the row. Row 10: Petal Row. 1 SC, 2 HDC, 3 DC, 2 HDC, 1 SC in each loop around. At the end of the row, slip stitch into the SC at the base of the loop to bring the yarn down for the band. Row 1: Beginning with the SC at the base of the loop from Row 9, 1 SC, 1 SC in each of the next two stitches, 1 SC in the base of the next loop from Row 9. 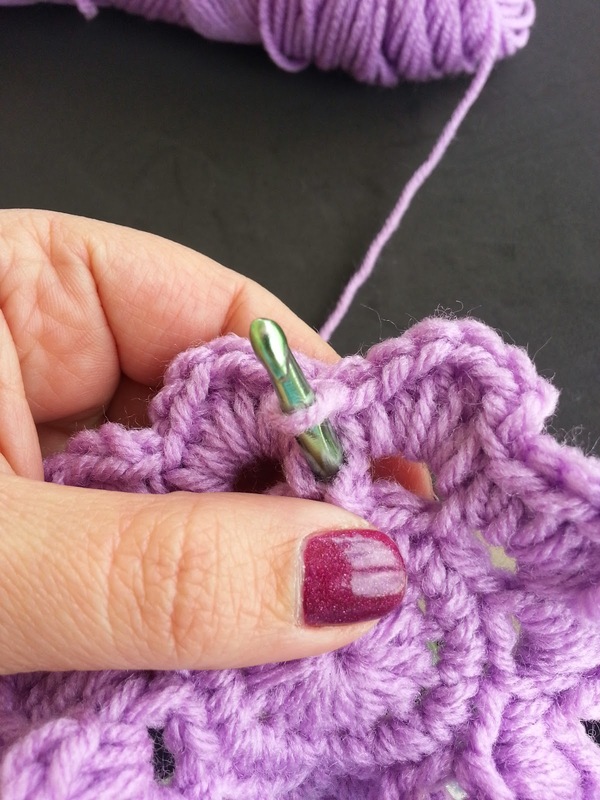 Slip stitch into the next stitch to secure the base of the band. Chain 1, turn. There are 4 stitches from the base of one loop to the base of the next. 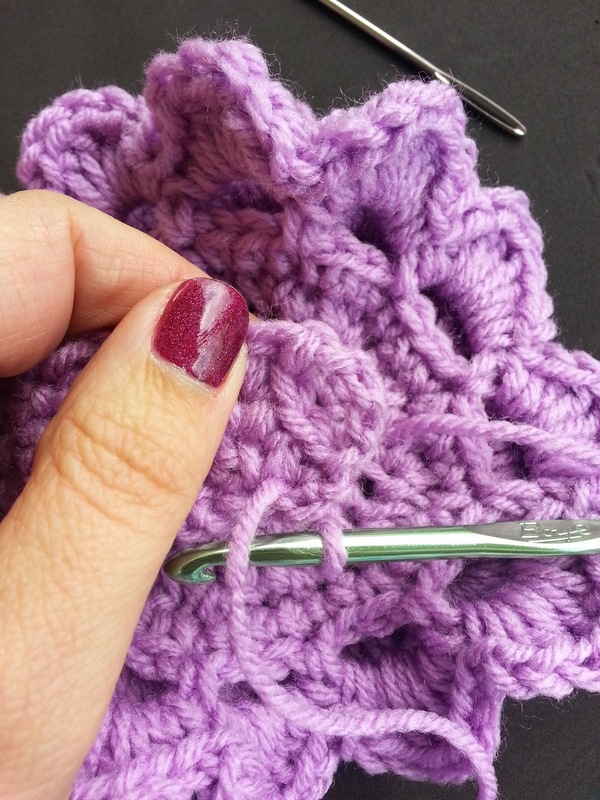 Slip stitch into the next stitch to secure the base of the band. 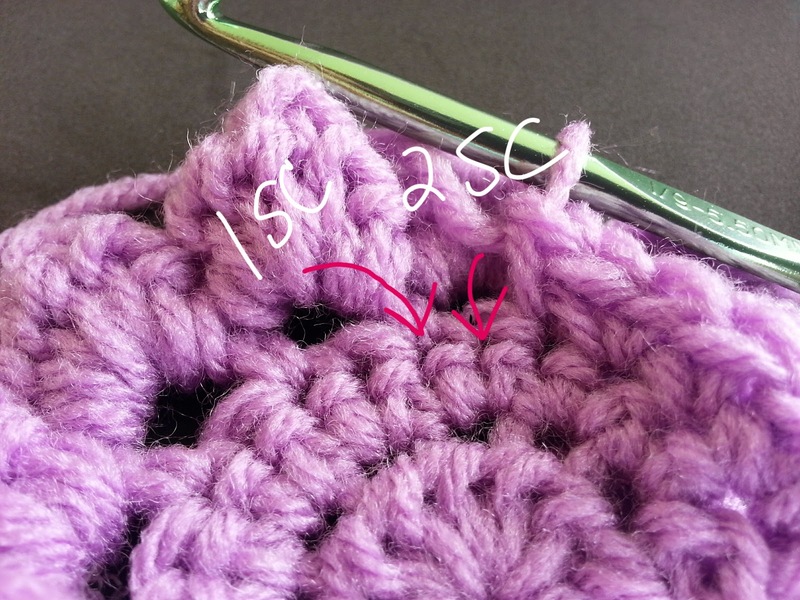 Rows 2-8: 1 SC in each stitch across (4 SC), chain 1, turn. Continue rows of SC until your band measures across the back of the flower. Stop when there is about 1/4 inch left between the end of the band and the side of the flower. Stop SC rows when the band reaches almost to the other side when laid flat. There should still be about 1/4 inch space left. 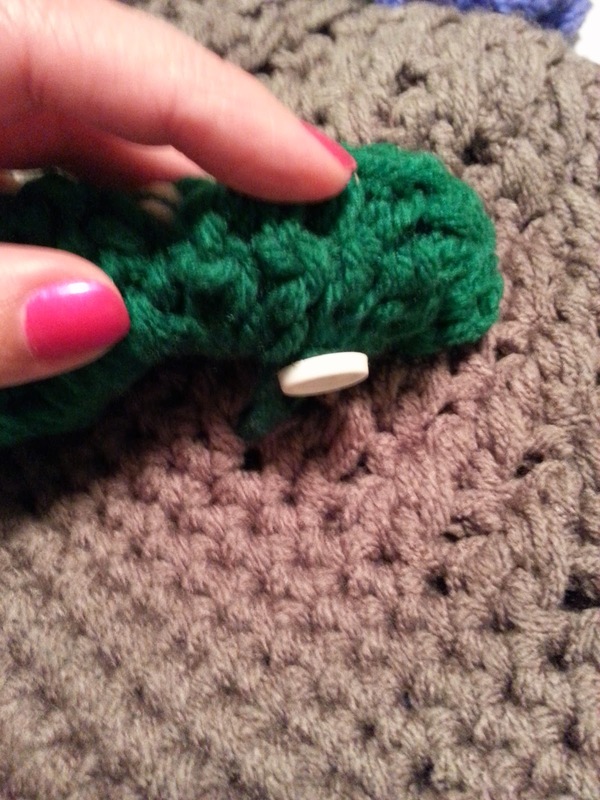 Form the loop: To form the loop for the button, chain 4, slip stitch into the last SC of the row. Fasten off and weave in ends. Next, take the tail left from the original MC and weave it over to the side of the flower opposite the beginning of the band. Use this yarn to fasten on the button. Weave the yarn from the center over to the side opposite the base of the band. Use it to attach the button. Slip the loop over the button. 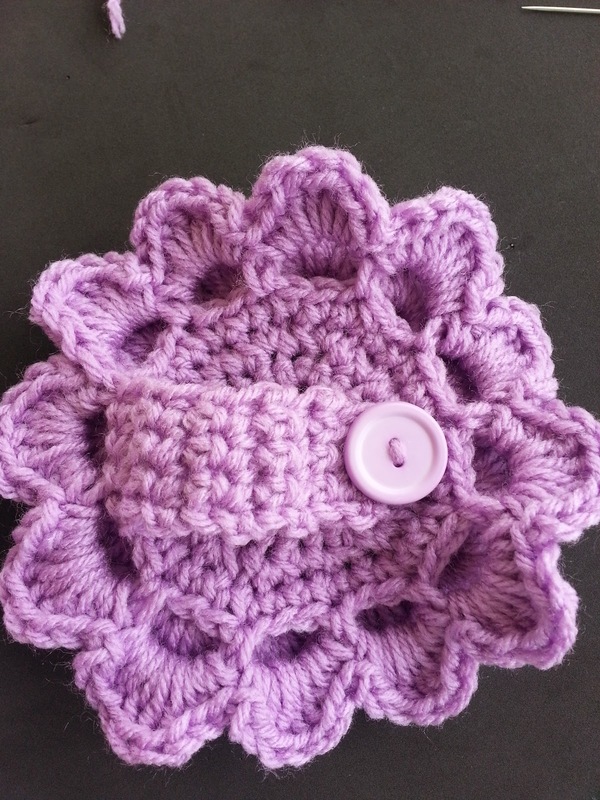 Optional: if you like the center of your flower to have more of a decoration, you can sew on any button or other decoration. As the petals push the previous rows forward, the center may be slightly visible. 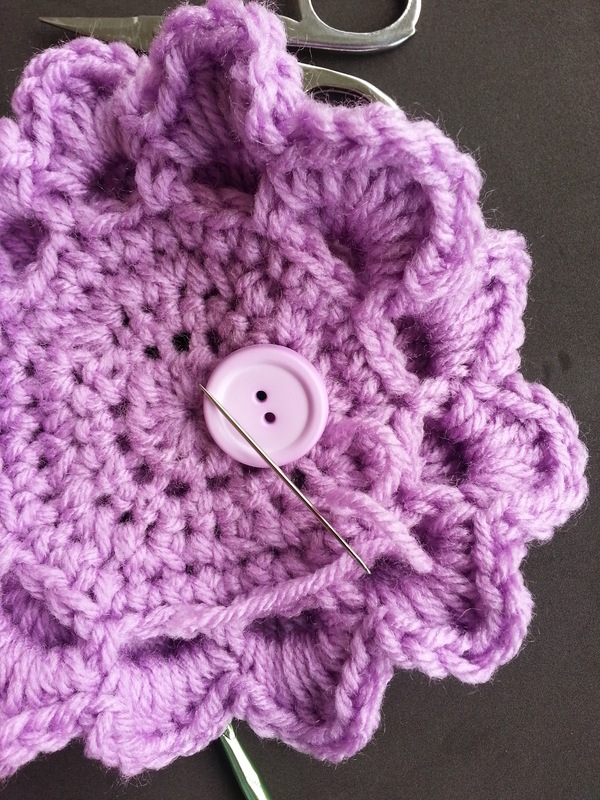 The first row of petals can be scruched inward to cover the center or you can attach a button. 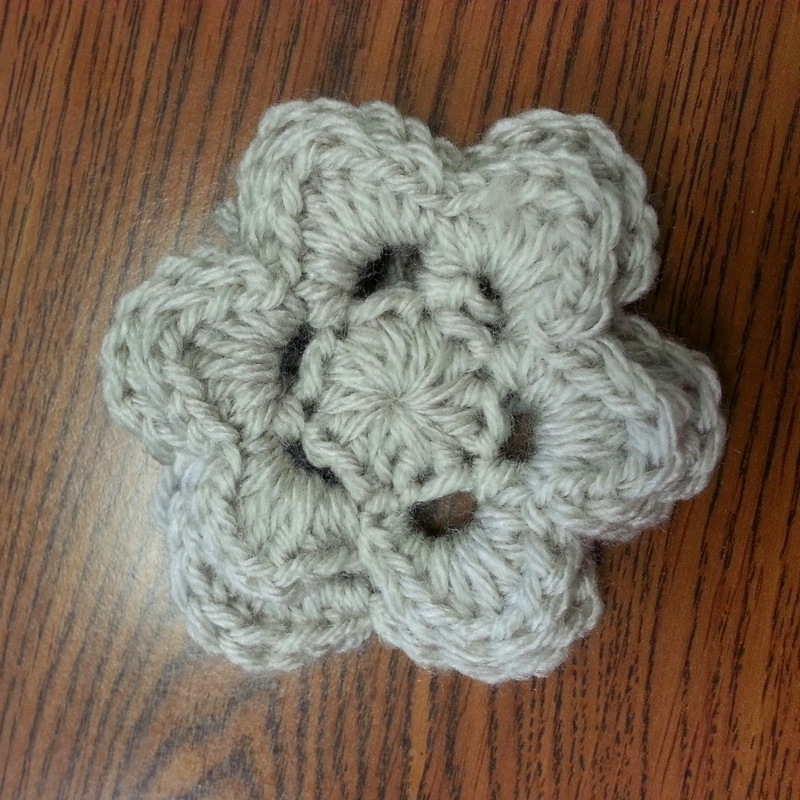 This flower can be attached to any piece that has space for you to slip the band through! Use it to secure a shawl. You may remember my angst regarding flowers from this post. 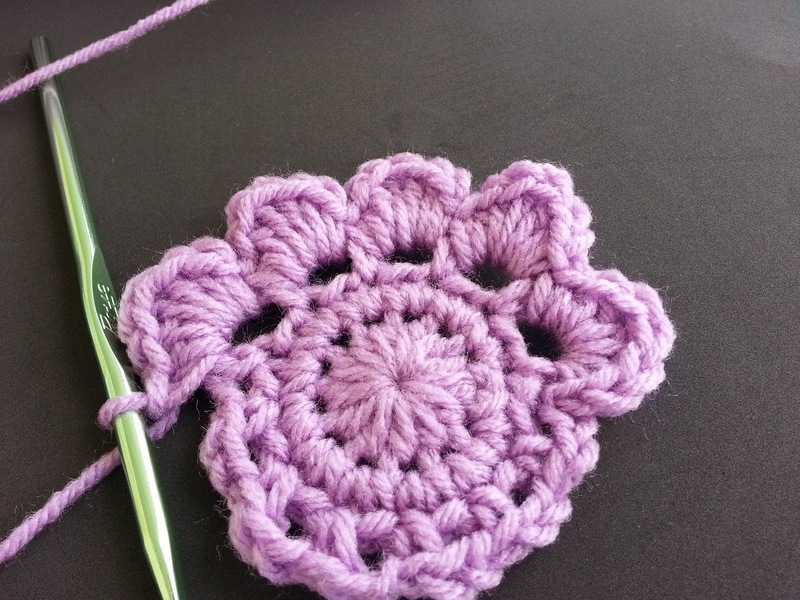 I promised to share my flower pattern with you. In reality, you can apply this to almost any flower you make. It just takes 1) having at least three stitches you can start in, 2) a button, 3) a place to secure the button where it will not be visible. Let's start with the flower. 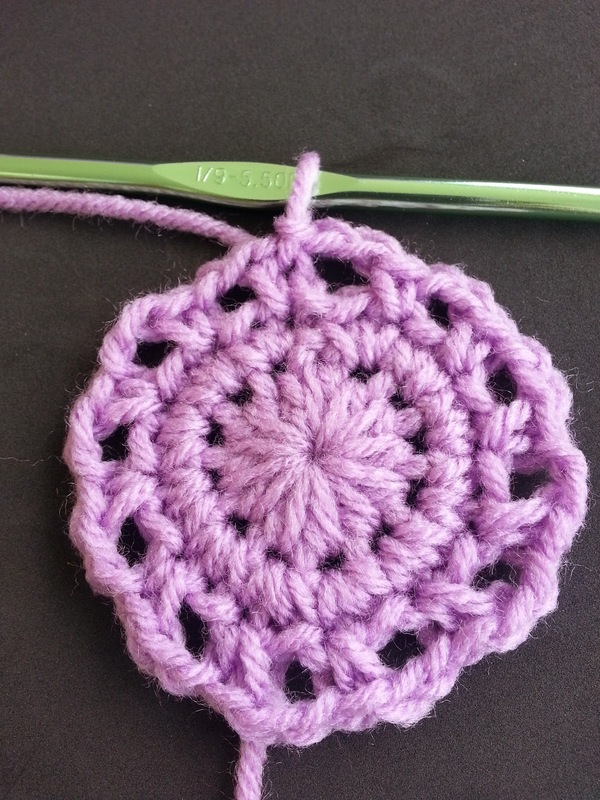 This is going to be a small flower and I will share a pattern for a much larger pattern soon. 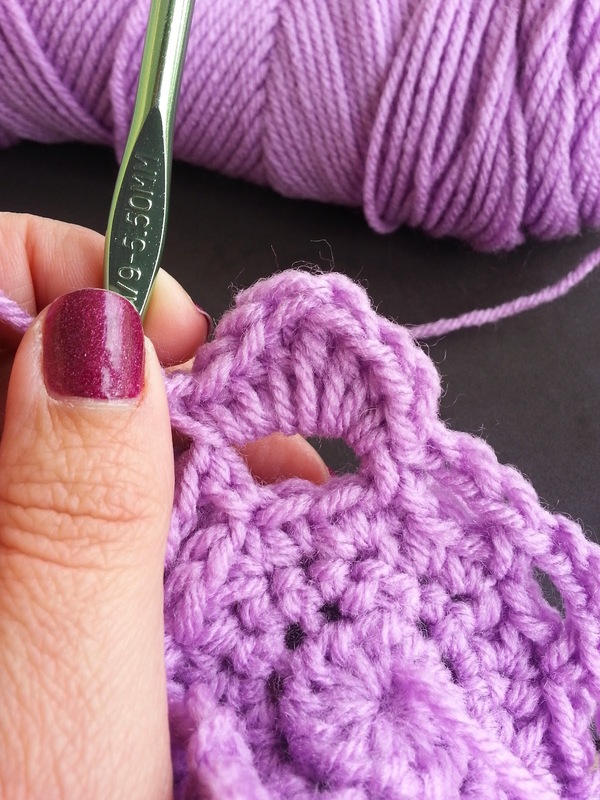 *If you are not familiar with the magic circle, you can begin by chaining 4 and slip stitching to the first stitch to close your loop. 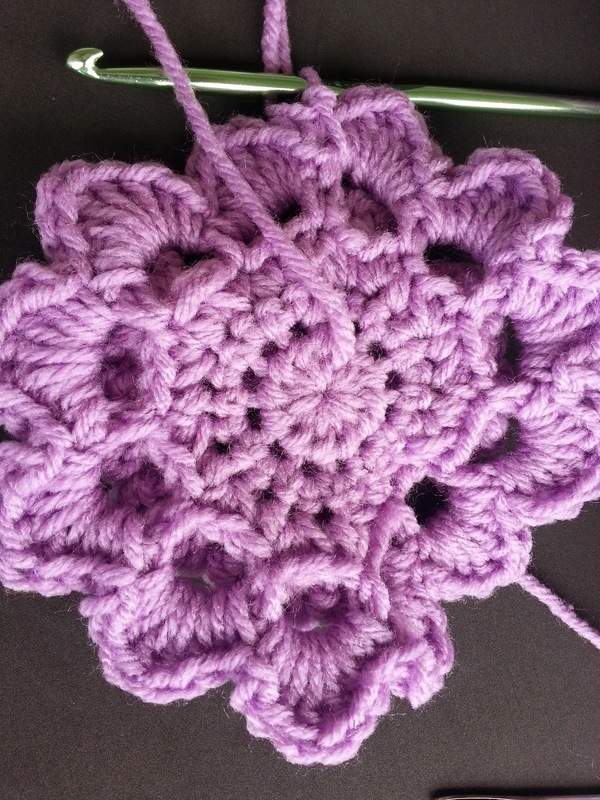 Row 1: Begin with a Magic Circle, chain 2 and crochet 12 HDC. Join to the top of the first HDC and pull tail tight to close the circle. Row 2: Chain 1, SC in the same stitch, *chain 3, skip one stitch, SC in the next. * Repeat from * to * four times. 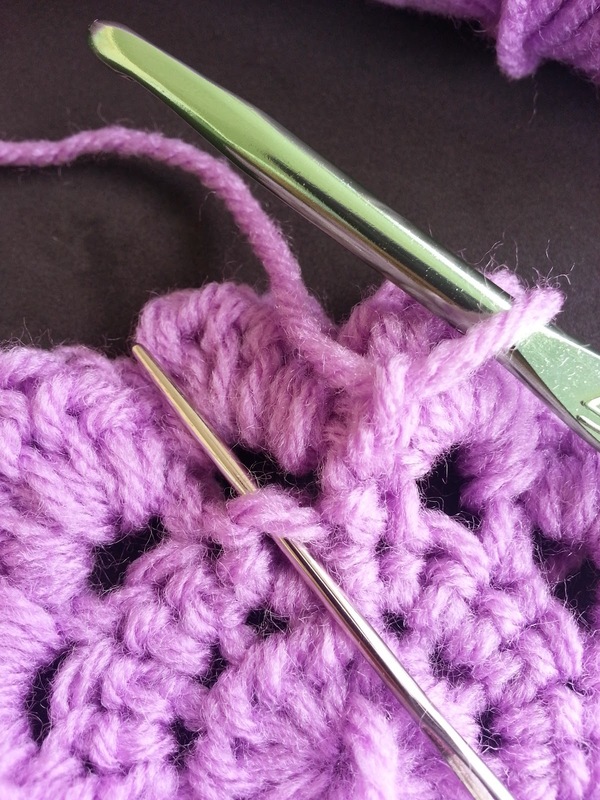 Chain 3 and slip stitch into the bottom of the first SC. Row 3 (petal row): Chain 1. 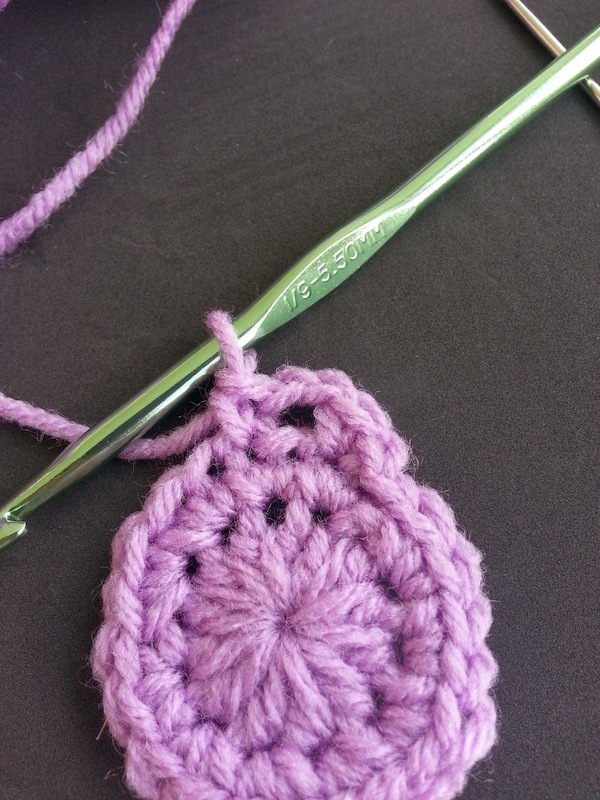 To make each petal, crochet the following cluster into each loop formed by the chains below. 1 SC, 2 HDC, 2 DC, 2 HDC, 1 SC. Repeat around. 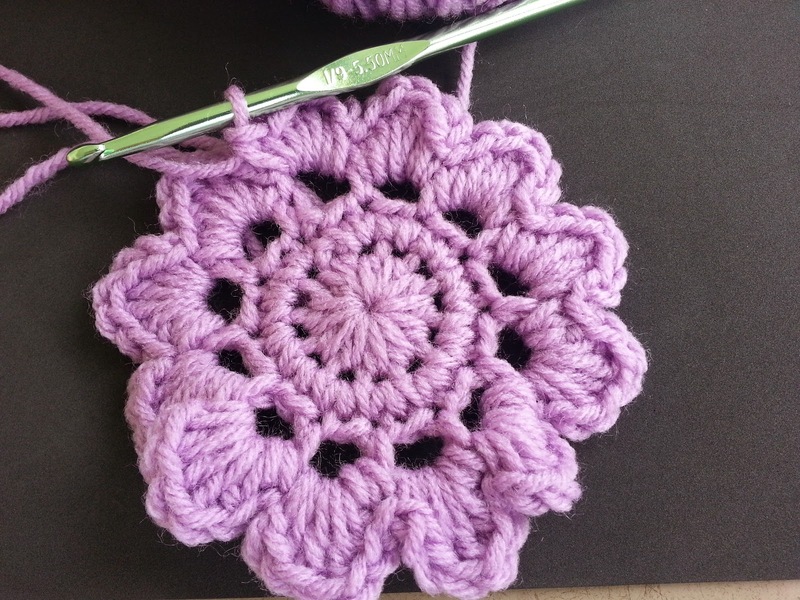 (Note: This combination of stitches will give you uniform regular petals. If you want your petals to be fuller or to ruffle more, increase the number of HDCs and DCs in each petal. The more stitches you put into each petal, the more it will ruffle.) Do not join. Continue to next row. Row 4: Looking behind your petals, bring your hook behind the petals and SC around the post of the first petal. *Chain 4. SC around the next post. * Repeat from * to * four times. Chain 4. Do not join. Continue to next row. 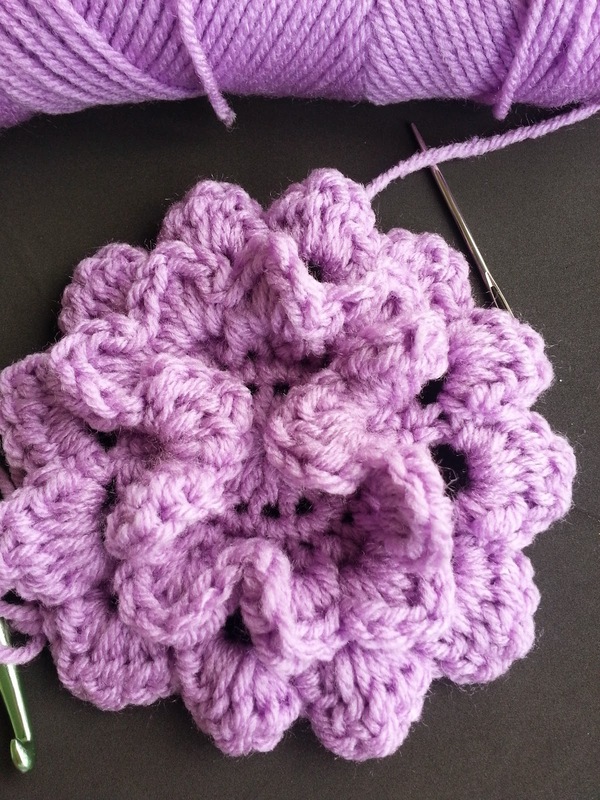 Row 5 (petal row): To make the first petal, SC into the first loop in row 4, then crochet 2 HDC, 3 DC, 2 HDC, 1 SC. Repeat this pattern in each loop formed in row 4. 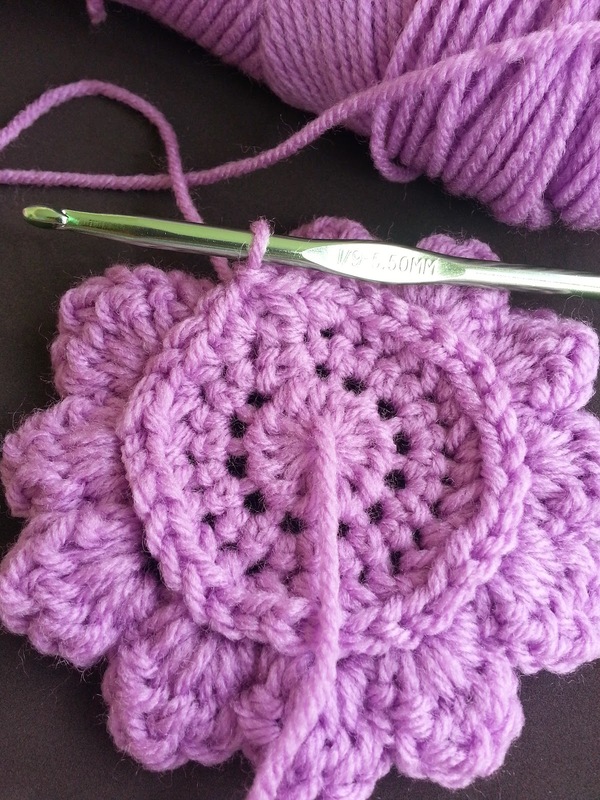 When you completed the last petal, slip stitch into the same loop, fasten off and weave in ends. 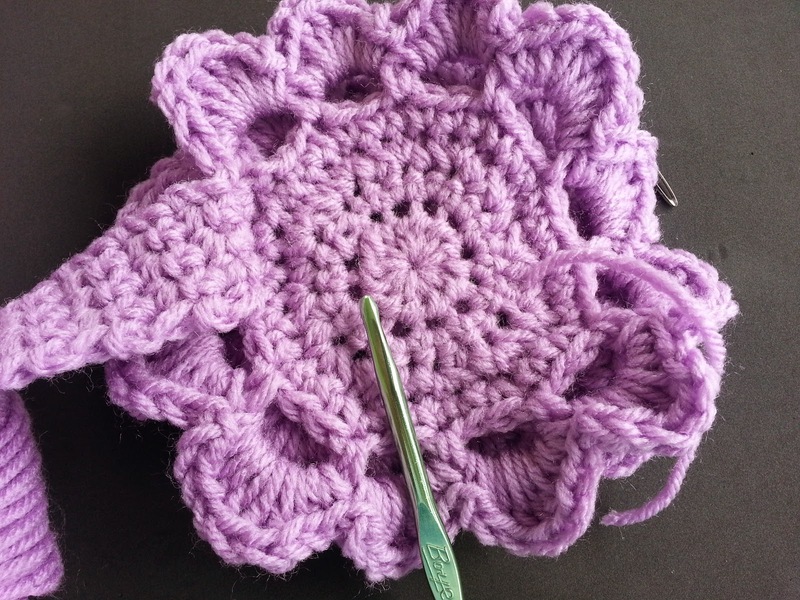 Row 1: Looking at the back of the flower, join your yarn by slip stitching around one of the petal posts from the previous round. 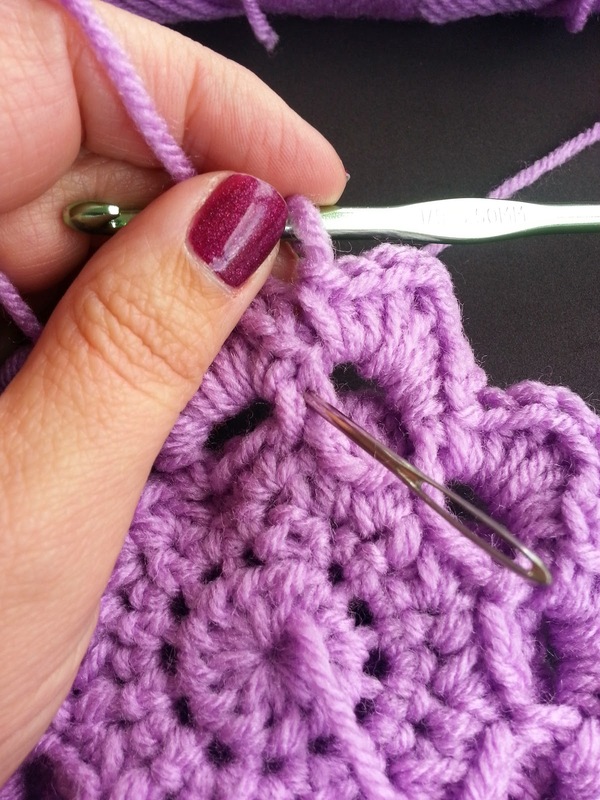 Chain 3 and slip stitch around the next post. Chain 1 and turn. Row 2: 3 SC into the loop. Chain 1 and turn. 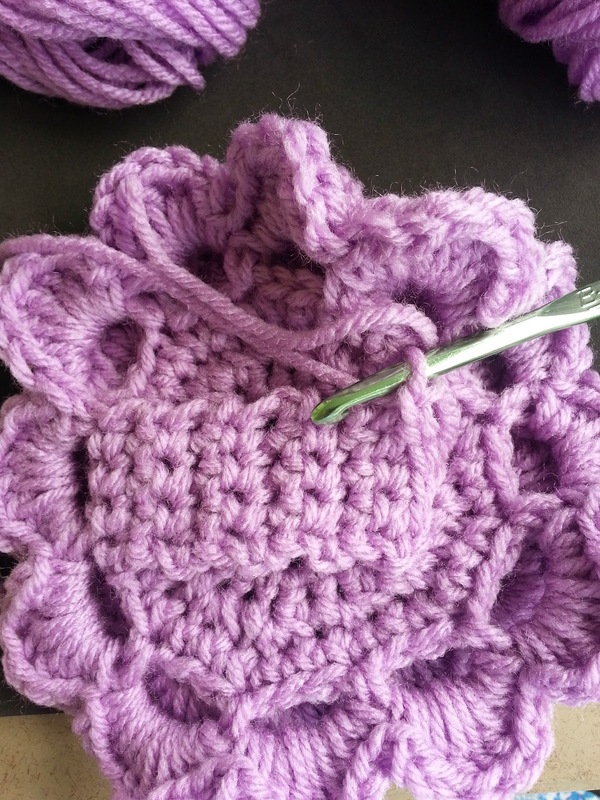 Row 3-5: 1 SC in each stitch. Chain 1 and turn. 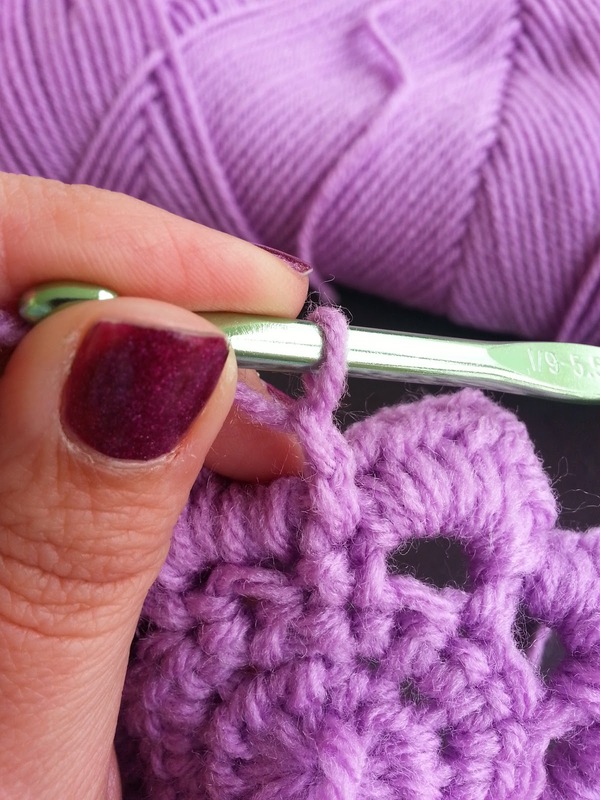 At the end of Row 5, instead of chaining 1, chain 3* and slip stitch the end of your chain into the last SC of the previous row. Fasten off and weave in ends. *The number you chain will depend on large your button is. For this pattern, I used a 3/4 inch button. You can experiment with your button and change the number of chains appropriately. Remember, you want a snug fit when you slip the button through. It should not be so loose that the button slips out of the loop. You will need to gauge exactly where to sew your button. 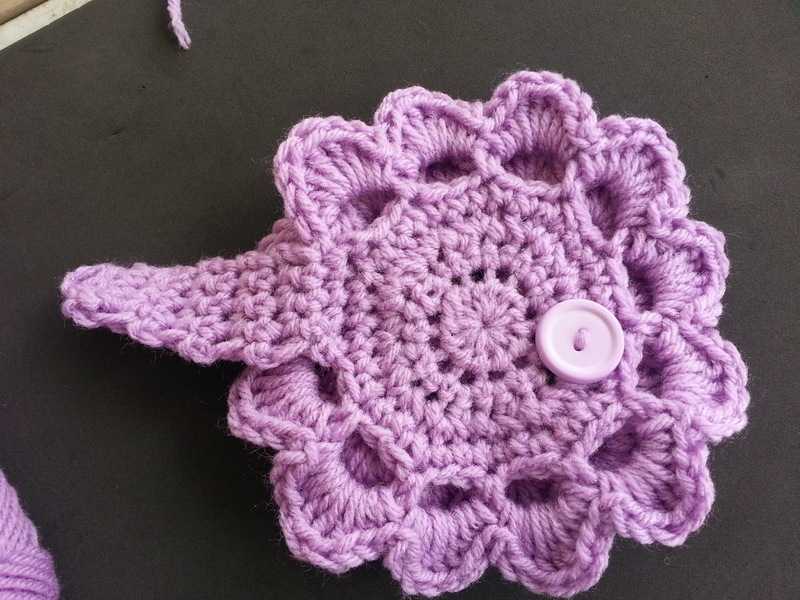 The button needs to go on the back of the flower lining up with the loop end of the band. 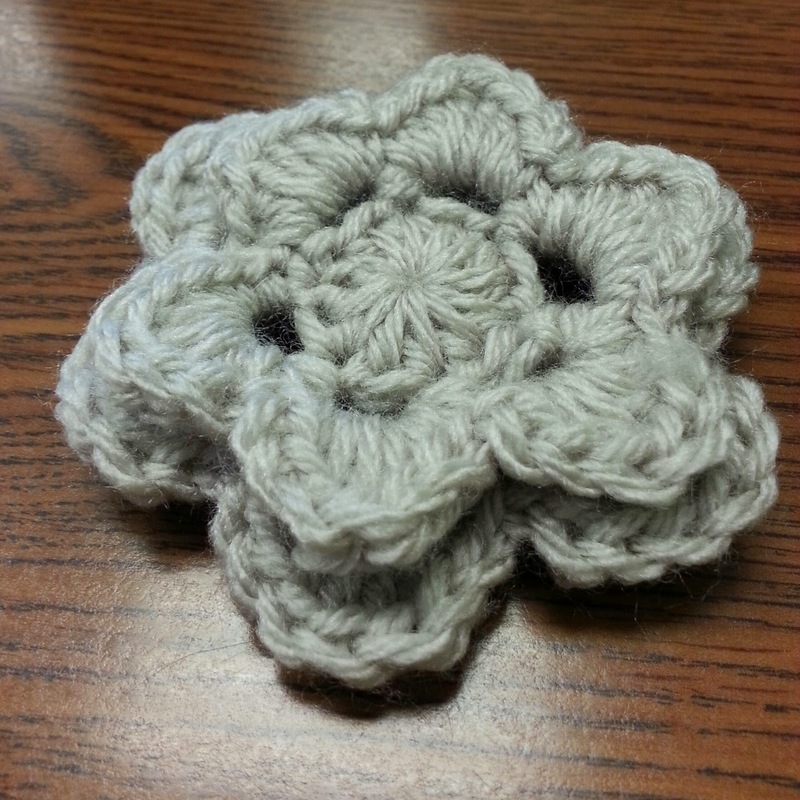 For this pattern, I sewed my button on the opposite side of the center of the flower, much like the one in this picture. 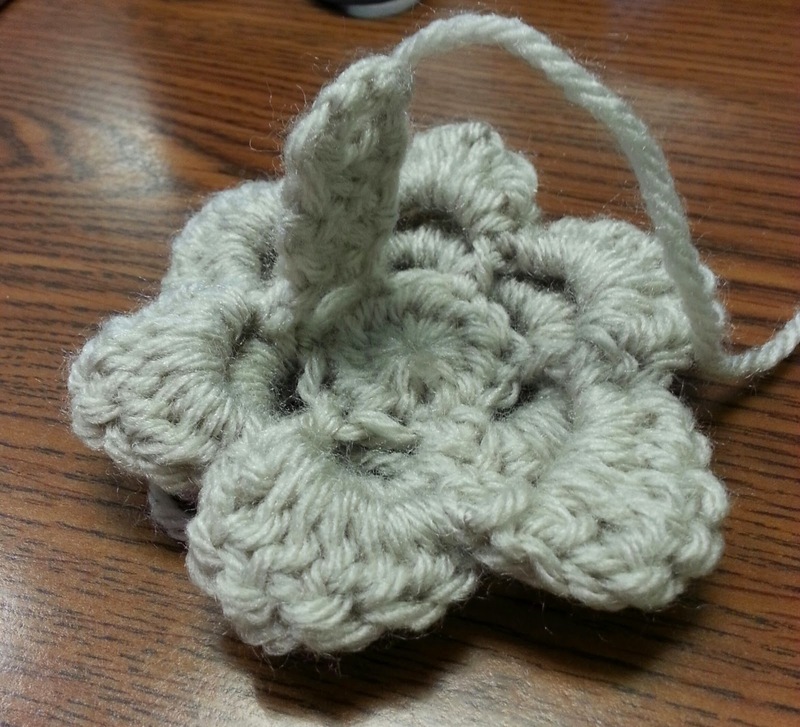 This is another flower made from a different pattern, but shows how the button should be placed. 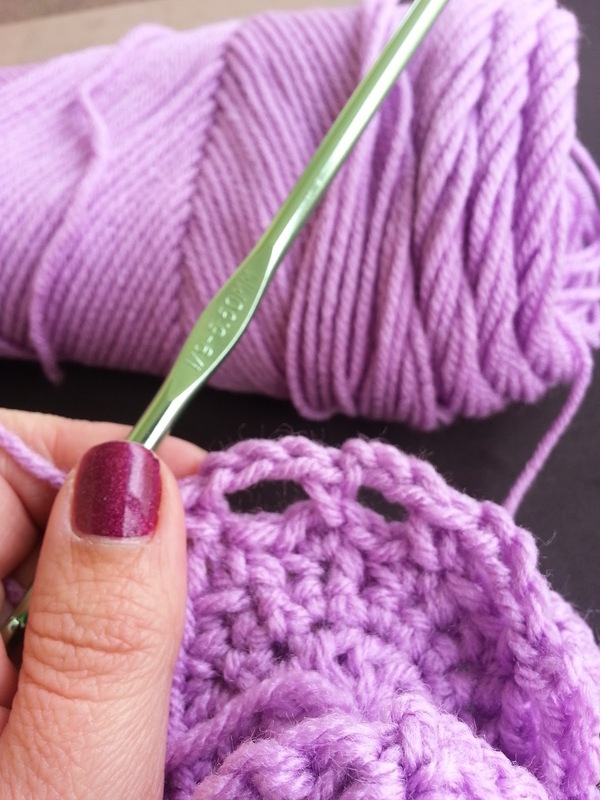 To use your flower, slip the band through several stitches of your hat, scarf, cowl, or garment of your choice. 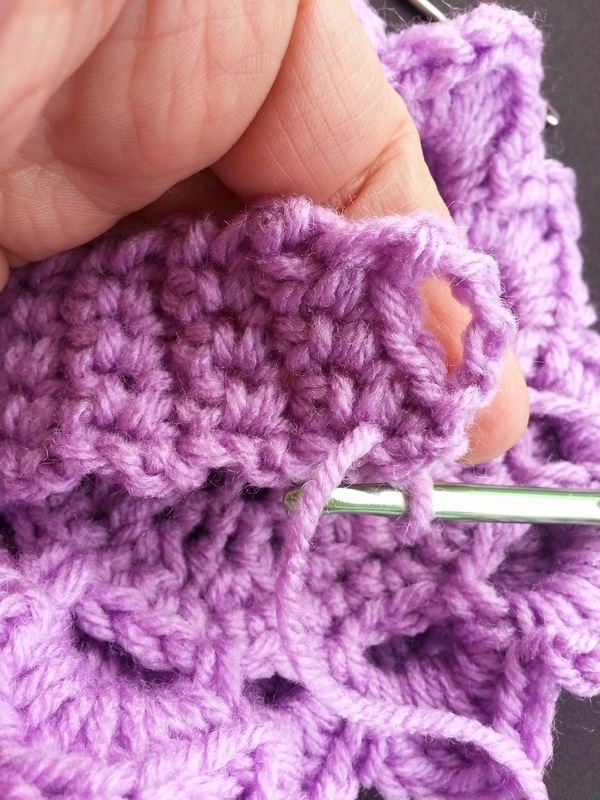 You should fit it through approximately the same number of stitches as you have rows to be certain it sits snuggly. Slip the button through the loop. Fit the band through several stitches of your hat or scarf. Slip the button through the loop on the band. And there you have it! Enjoy! You know what's frustrating? 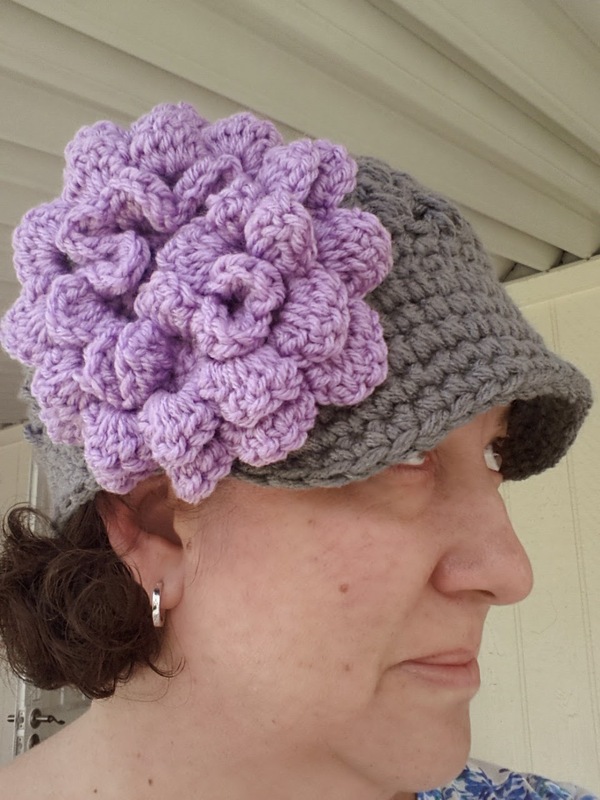 Making a flower for a hat and loving it enough to sew it onto the hat only to wish you could replace it later. 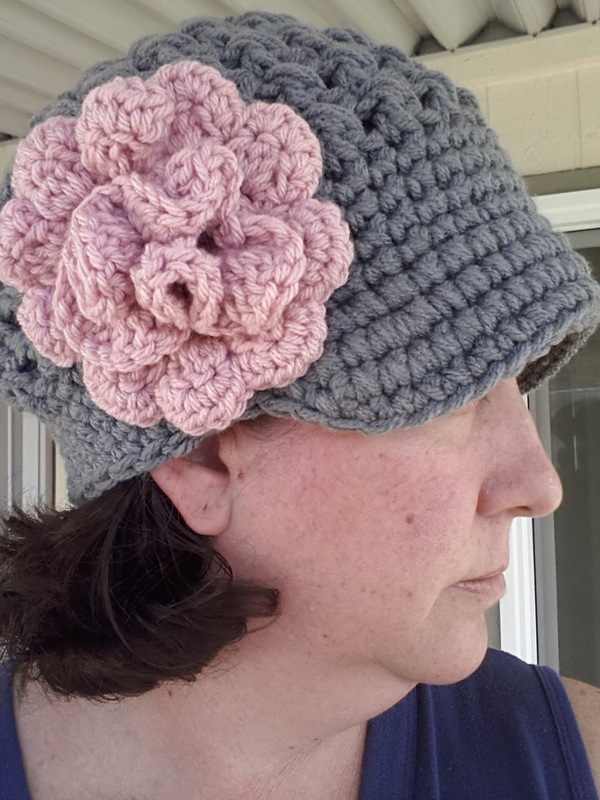 I have a lovely black hat that I sewed a turquoise flower onto and I love it, but the other day, I really wanted the flower to be pink. Really wanted it to be pink. 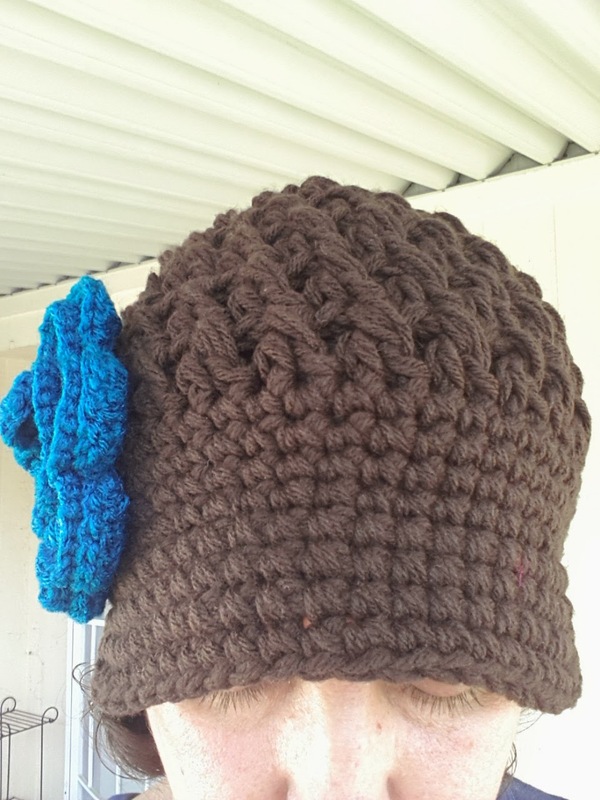 Short of making an entirely new hat or cutting the turquoise flower off, I really did not have an alternative. Many designers have come up with different ways to make flowers removable. Some attach flowers to alligator clips and clip them on. 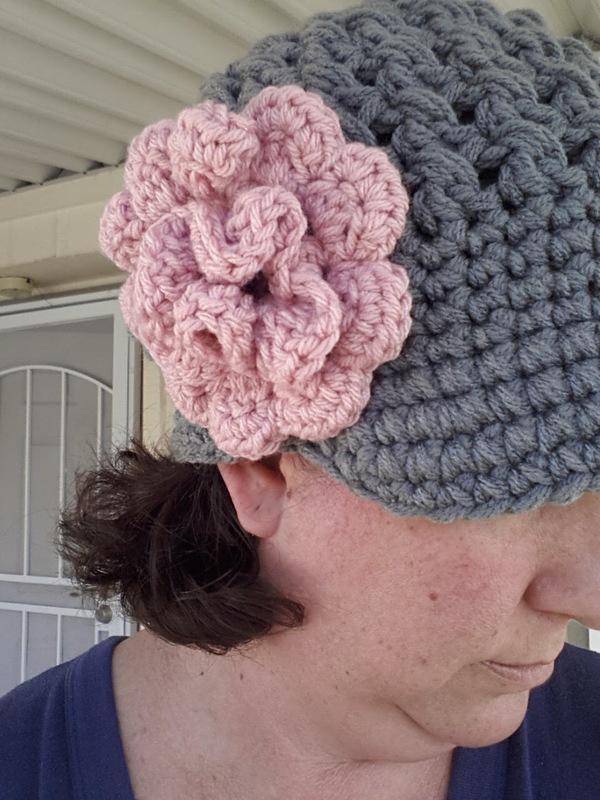 This idea could work, except I don't like the way the alligator clip makes the flower sit on the hat. I also worry that the flower could fall off too easily. Not to mention how do you wash it? By hand? Other designers have created flowers with a hole in the center of the flower that allows them to slip a button through it. 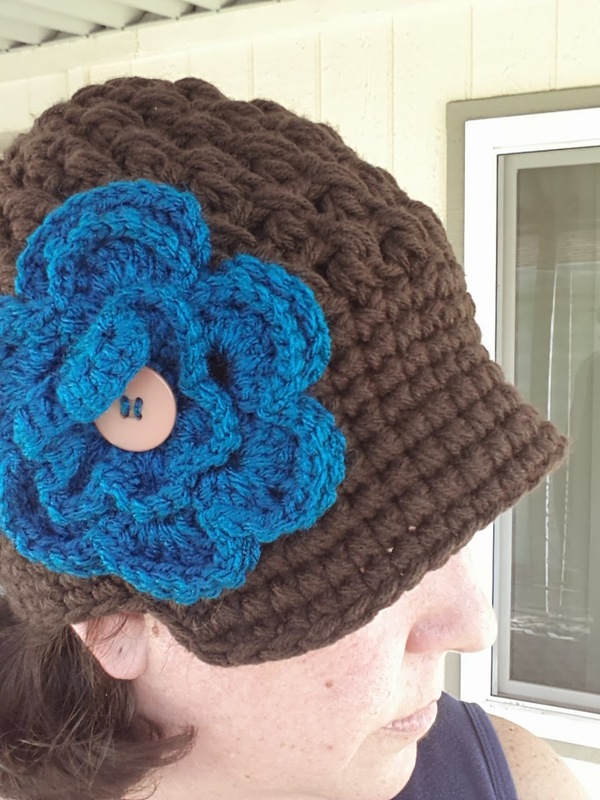 They attach the button to the hat and then flowers can be slipped on over the button. I've browsed through many of those patterns, but never found one that allowed for the flexibility of the type of flower. I set out to see if I could make the button idea work. I like really big flowers, so I tried several different types and designs to see what would happen. I think I made 6 or 7 flowers, none of which sat right when I completed them. The hole I needed to leave for the giant button just was strange and I had to use a color that would work with every flower I might want to attach. That's harder than you think. Frustrated, I set the whole thing aside. And then, one day, while I was sitting in traffic, I had an epiphany. I was going about this all the wrong way. 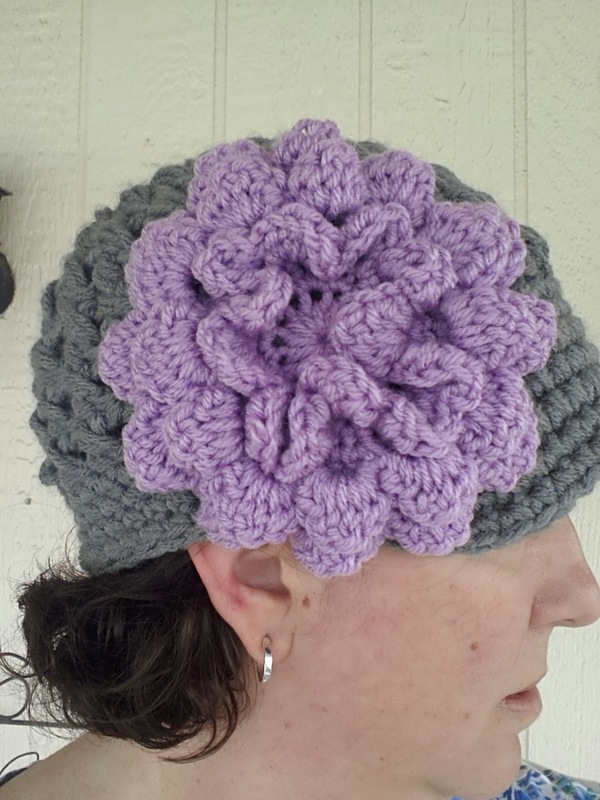 To truly make this work, I needed the flowers to be able to attach themselves to any crocheted hat. The alligator clip would not work and a button through the middle would not work, but what if I combined the two ideas? 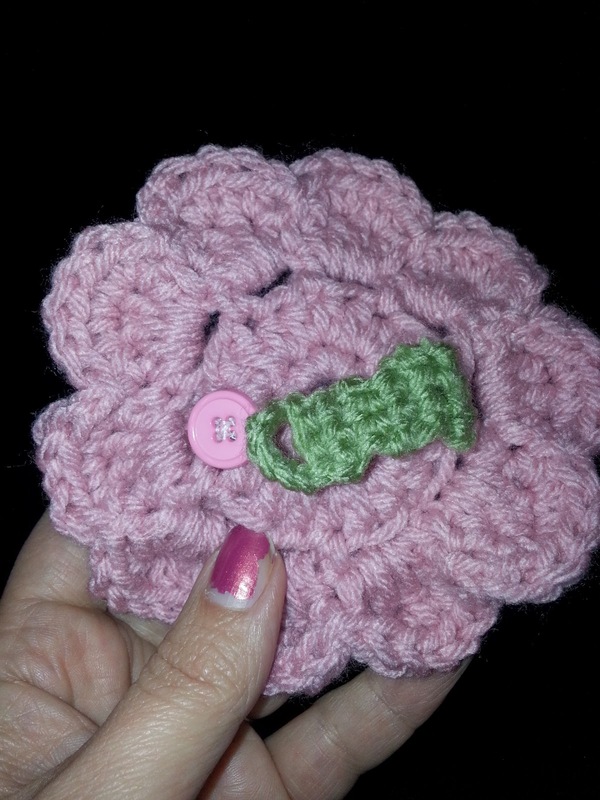 What if I crocheted a short band on the back of the flower and attached a small button? The band could go through the hat and attach to the button on the back of the flower. My first flower with the new attachment! The flower is slipped through the crossed DCs! I practiced moving it around and it fit perfectly every time. Small flap with button on the back of the flower. Here is another one I made! I know. The flower is ginormous! To date, I've made 10 of these flowers with different patterns. I just love them and I love how quickly they work up. I could keep making them for the foreseeable future! Would you like to try to make one yourself? Stay tuned for the pattern coming soon! 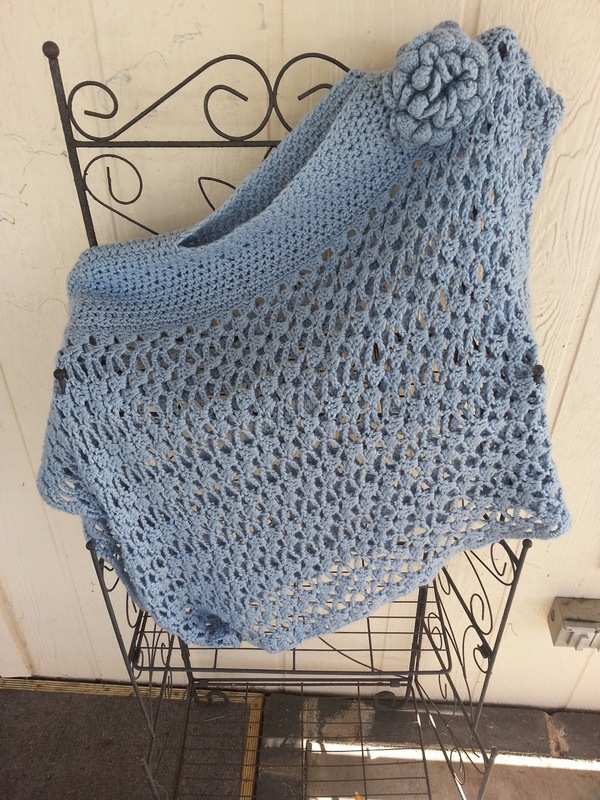 My original Lacy Trellis Poncho was made in an asymmetrical style. 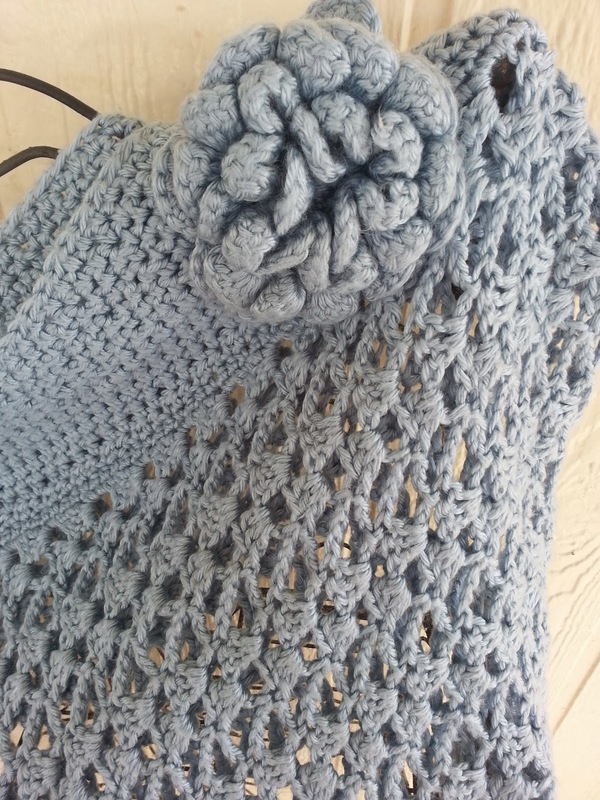 It is crocheted in one tall, long strip and folded together. Instead of being a vertical trellis, the pattern laid on its side creating a horizontal pattern. 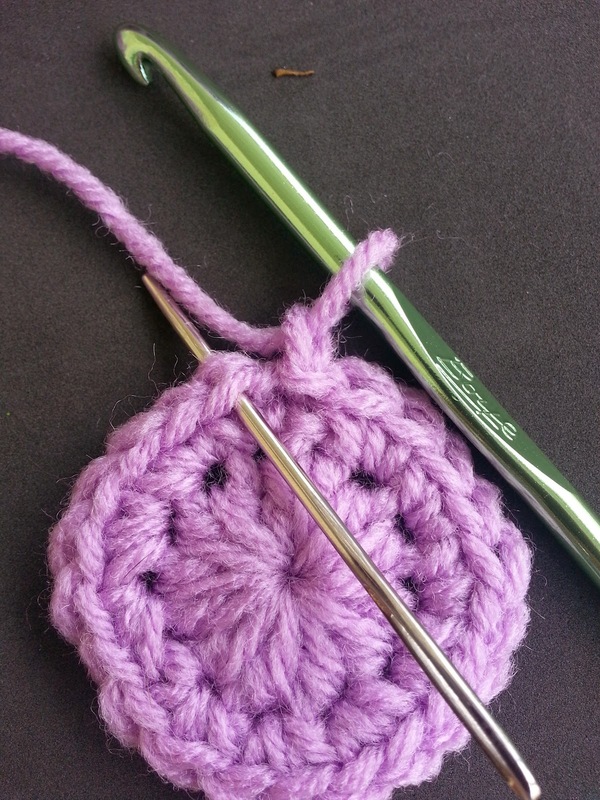 It is very easy to make and you can add your own flair to it by changing up how you crochet the long piece together. 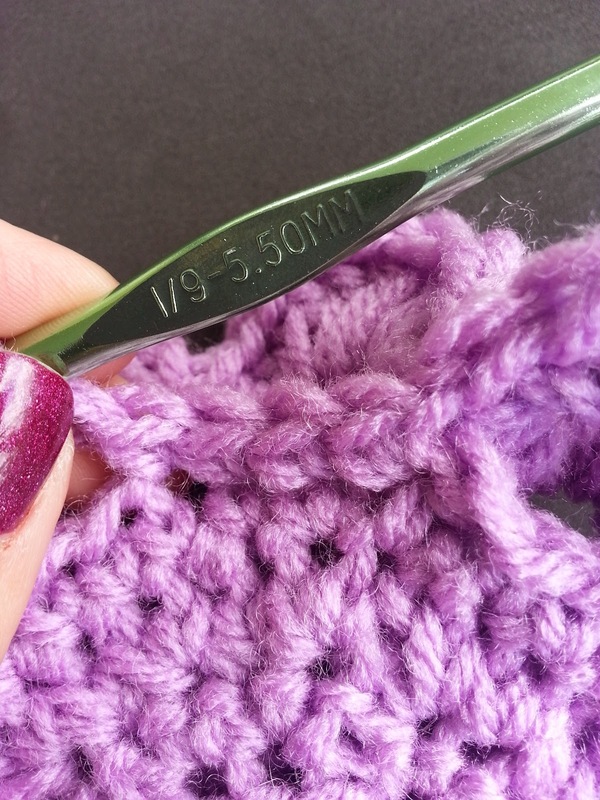 Before you actually start crocheting, you have to take some minimal measurements. Of course, you could do this on the fly, but to achieve the look you want, you should start by measuring. Measure from your wrist to your shoulder. Your starting chain needs to measure this long. Hold out one of your arms, perpendicular to your body. Measure the distance from your hand across your chest to your opposite shoulder. Take this length and multiply it by two. This is the length of your finished piece before you connect it. Next, measure the distance from one shoulder to another. This is the space you need to leave open for your head. For picture help with this Lacy Trellis Pattern, view this post. Chain: a multiple of 8 plus 6 more chains. I started mine with 78 chains. Row 2: Chain 3. 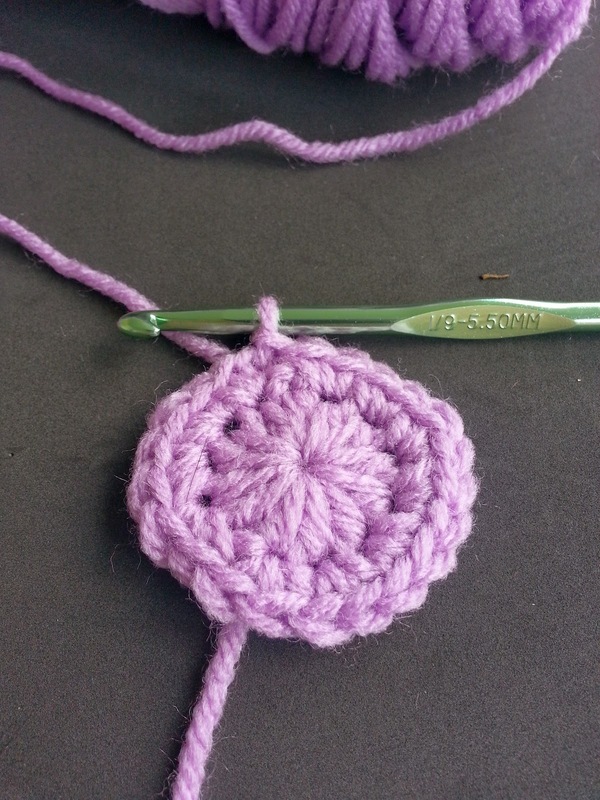 Skip 3 SC and double crochet (DC) 3 times in the next SC. *Chain three, skip 3 SC, and SC in the next SC. Chain 2, skip 3 SC and DC 3 times in the next SC. * Repeat from * to * ending with 3 DC in the final stich of the row. Chain 3 and turn. Row 3: DC 3 times in the first chain 2 space from the previous row. *Chain 3, SC in the top of the first DC in the next cluster. Chain 2, 3 DC in the next chain 2 space. * Repeat from * to * across. Turn. Continue repeating Row 3 until your piece measures the length you measured prior to beginning. For mine, I crocheted a total of 104 rows. Row 105: At the end of row 104, chain 1 and continue working along the long horizontal side. SC twice in each side of the DCs and once in the space between. Continue along to the end of the side. Turn. Row 106: Chain 1. One SC in each stitch across. Turn. Row 107: Chain 1. One SC in each stitch across. Turn. At this point, you have several options. 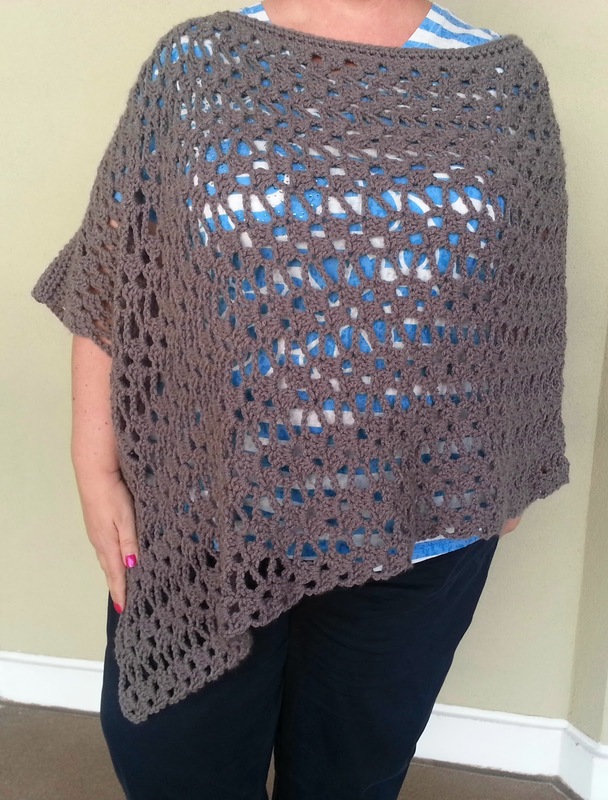 For the poncho pictured above, I continued with 10 rows of half double crochets to create a solid band of stitches. 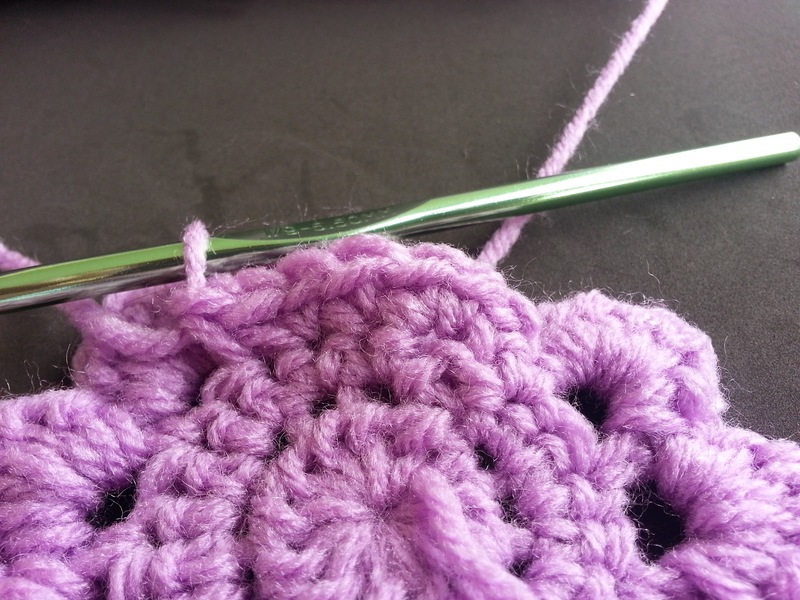 Then, I crocheted one row of single crochet. You can also continue SCing across in rows to create a band of solid stitches or finish off at the end of row 107 and prepare to sew the pieces together. 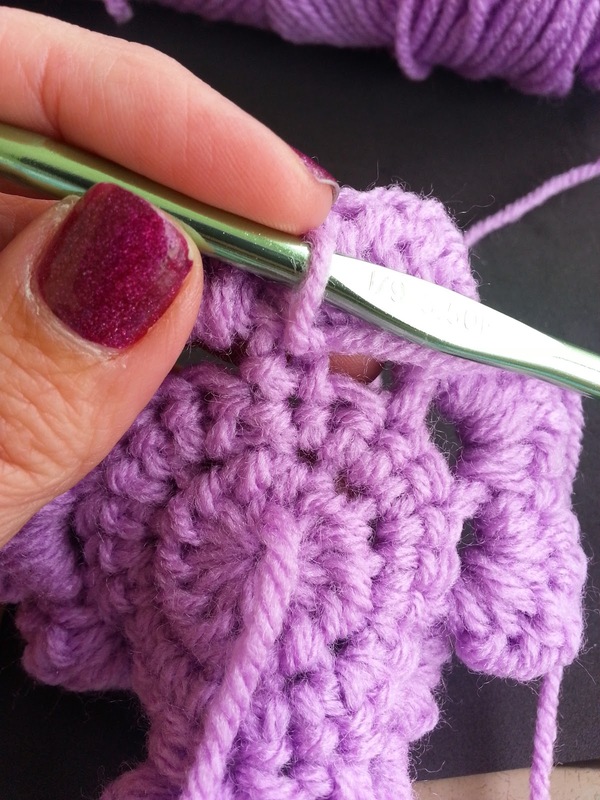 Fold the piece in half along the side you single crocheted across. My students would call this folding it like a hamburger. 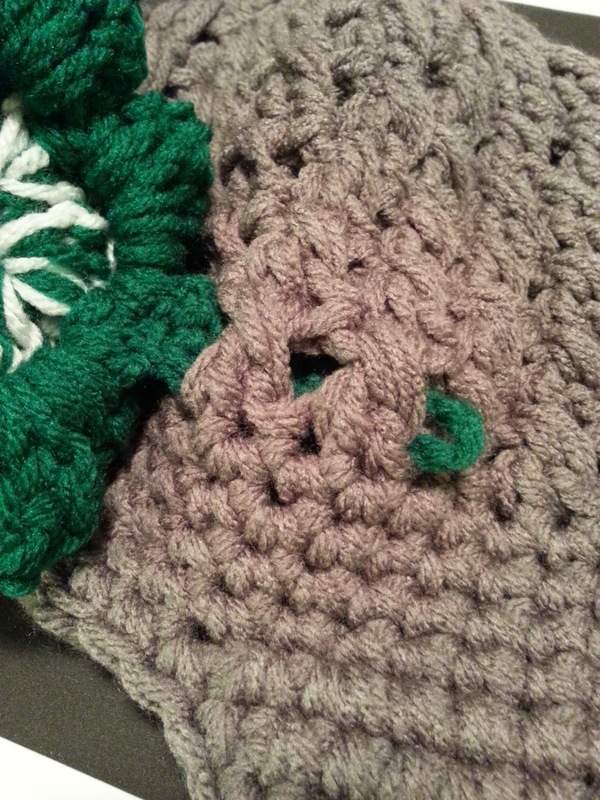 :) Hold the single crocheted side together and whip stitch the two sides together half way. Fasten off and weave in the ends. 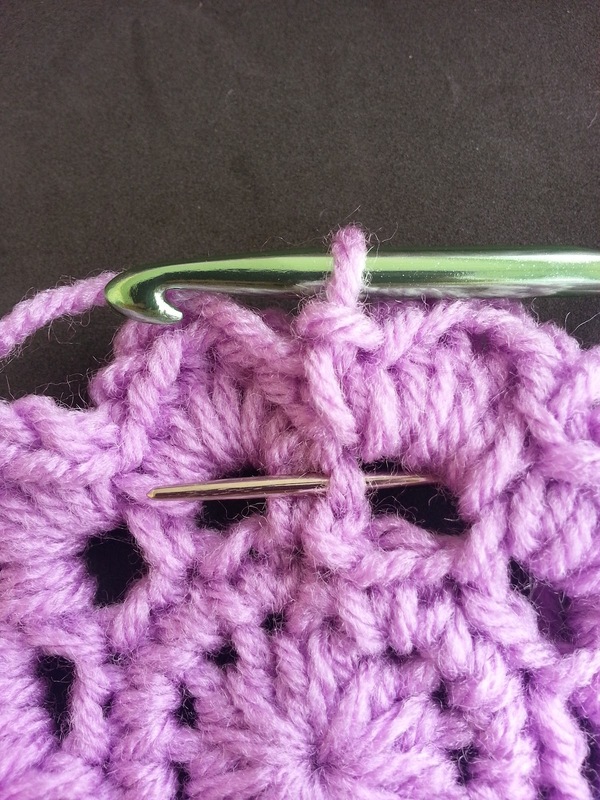 You can also use the join as you go method to single crochet half way along the side and join the two sides together. 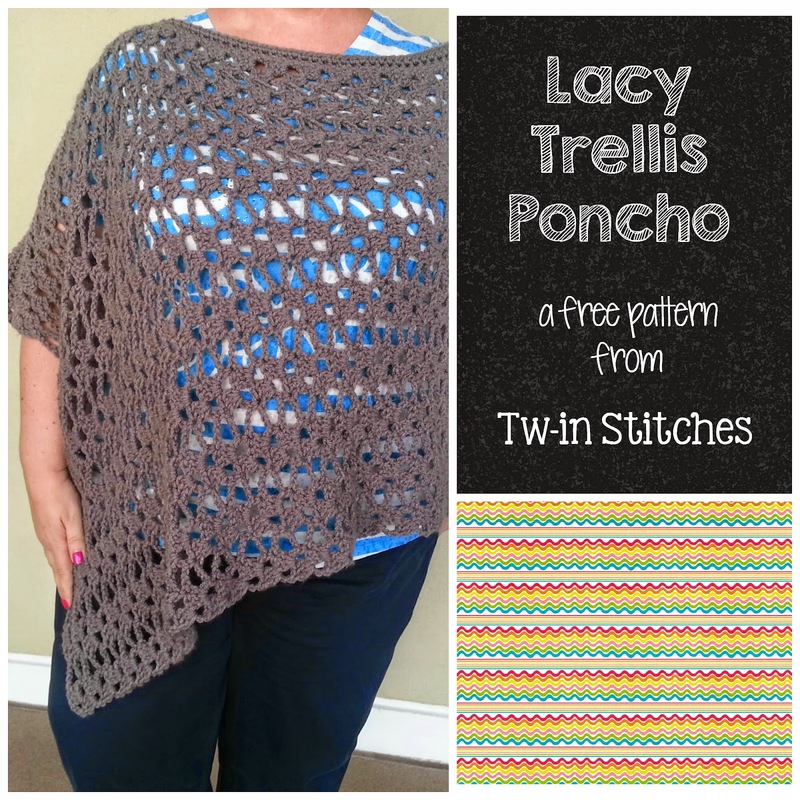 If you make a Lacy Trellis Poncho, will you share it with me? 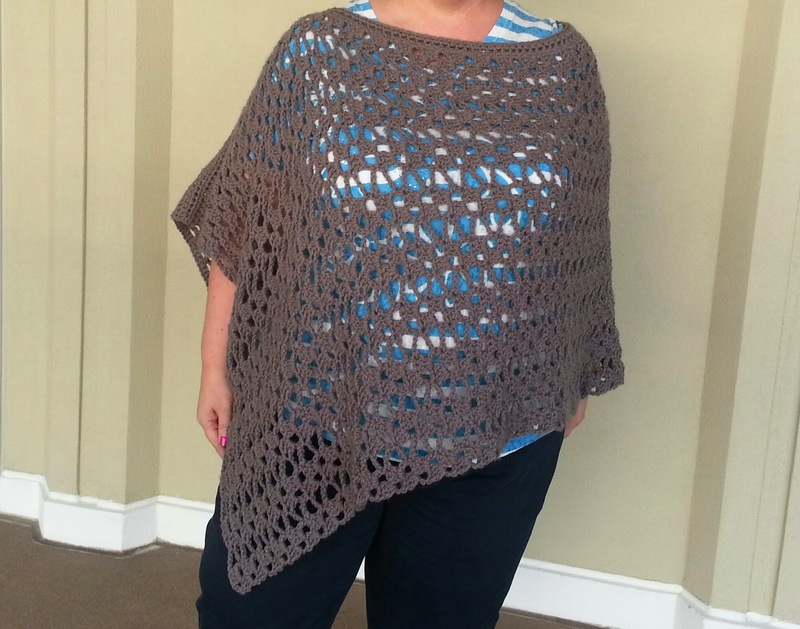 Post your poncho on my Facebook page.